Following the first day of individual dressage competition at the XVI Pan American Games, Tom Dvorak, 46, of Hillsburgh, ON, sits in fourth place, just over one percentage point behind third placed Marisa Featherling of the United States. Riding Viva’s Salieri, a 10-year-old Canadian-bred Hannoverian stallion, Dvorak received a score of 73.079% in the FEI Intermediaire I test, which forms the first half of the individual medal competition. On Sunday, October 16, Dvorak led Canada to a Team Silver medal as well as a berth for the 2012 London Olympic Games. All four members of the Canadian Dressage Team contested the Intermediaire I with excellent results. Calgary’s Crystal Kroetch, 54, rode her 10-year-old Hannoverian gelding Lymrix to a ninth place finish with a score of 71%. The Canadian team’s youngest member, Tina Irwin, 30, of Stouffville, ON, finished close behind in tenth with a score of 70.842% riding Mary Ellen Horgan’s Winston, a 14-year-old Dutch Warmblood gelding. Roberta Byng-Morris, 48, of Godmanchester, QC, was the Canadian rider to make the biggest leap up the leaderboard, moving from 25th in the team competition to 16th in the Intermediaire I with a score of 66.947% riding her 12-year-old Hannoverian gelding, Reiki Tyme. The top 15 competitors from the Intermediaire I test qualify for the Individual Freestyle, after which the individual medals will be awarded. However, as a maximum of three competitors per nation are allowed to contest the Individual Freestyle, Dvorak, Kroetch and Irwin will be Canada’s three representatives. Delighted with his results to date with Viva’s Salieri, Dvorak is hoping for even more in the Individual Freestyle to Music on Wednesday afternoon. Dvorak’s horse, Viva’s Salieri, is owned by its breeder, Augustin Walch, and his wife, Christine, who travelled to Mexico to watch their horse compete for Canada. Kroetch also improved both her score and her placing from the team competition to Monday’s individual competition, and has every intention of moving even further up the standings in the Freestyle. 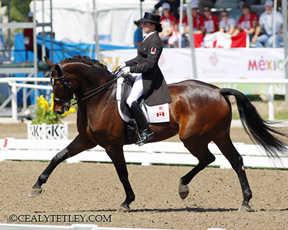 Canadian Dressage Team Chef d’Equipe Gina Smith of Brockville, ON, and Team Technical Leader Markus Gribbe of Germany have been thrilled with the Canadian results in both the team and individual competitions. The Intermediaire Freestyle to Music, by far the most popular spectator event of the Pan Am Games Dressage competition, will commence at 3 p.m. on Wednesday, October 19, at the sold-out stadium at the Guadalajara Country Club. The Canadian Dressage Team is assisted at the Pan American Games by Team Veterinarian Dr. Alan Manning. The Canadian Equestrian Team is supported at the Pan American Games by Team Leader Kerri McGregor of Newmarket, ON, and Assistant Team Leader Tina Collins of Loretto, ON. For more information on the 2011 Pan American Games, held every four years, please visit www.guadalajara2011.org.mx.